It's no secret to you guys, that I'm a huge fan of white sneakers. So much so, that my classic Reeboks, that I've shown you an embarrassing amount of time here on the blog, are currently up to the third generation. Foot Locker and The Apartment (talk about a fun crew to hang with!) so generously took me for a Soho fro-yo and a spin in these awesome Nike Air Force 1 as a part of Foot Locker releasing "The White Collection". I needed to try a new style with my almost religious dedication to white sneakers, and how cool are these? I find them being perfect companions for summer, sun and tanned legs and I've already been wearing them heaps. May they stay box white! Fiber cloth in one pocket and soap in another. Video is not my forte, but I hope you'll enjoy a bit of Soho fun. As a quick note, half a minute in where it looks as if I'm having a go at some innocent by passer, it's just me explaining something to my girl Abi who was just behind me. I watched this over and over, and couldn't remember having a go at someone! Also, a little fun note to my funky moves at the end of the video: Hare Krishna was passing us at some point while we were filming, dancing and singing, so I decided to join in when one of the munks was looking our way. Such a fun day! Gorgeous outfit!! I love love loveeee, the stripes look so good! You look incredible as usual ! Love the blazer and the shoes ! 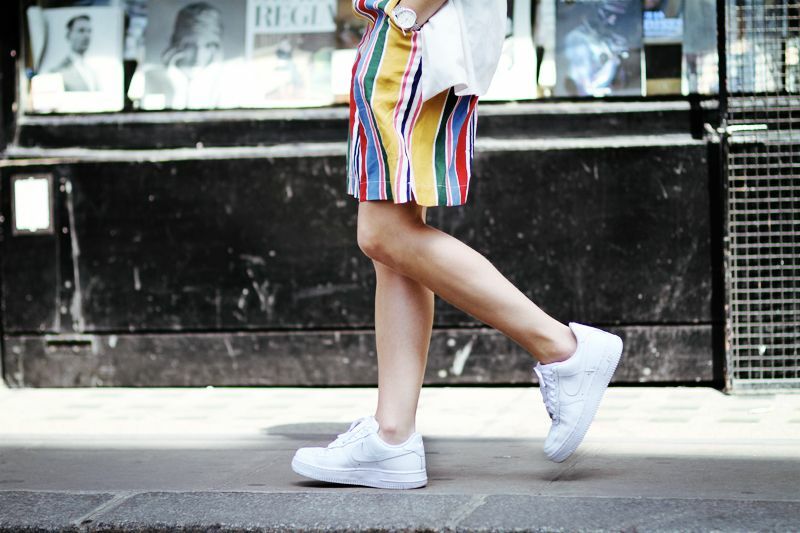 Love the vintage striped shorts! I love it Sarah! The vintage bermuda shorts are amazing! Wish I had them too.. So cute! You come across way better on camera than I would..! Wow! This is such a stunning outfit! I adore every single piece! I want those air force Nike. You're adorable!!! Ahh it's always so exciting to hear bloggers speaking!! Anyways, I totally agree. I love that sneakers in general are slowly but surely becoming a larger and larger part of fashion. I swear by my converse, whether it's for school or going out at night!! I just love this look!! And the sneakers are perfect!! this is so beautiful! I am speechless. Love it and the enviroment is perfect! Ahh you're shooting in front of Spuntino, the coolest Soho diner. Love that place - I reviewed it on my blog here: http://hyhoi.com/2014/05/spuntino-small-mighty-brooklyn-diner-soho/ - a must-visit for all trendy Londoners! Such a lovely and sincere video! I have lately started loving trainers and these kind of slip-ons, too. I just bought a pair of slip-ons from H&M and I've worn them almost every day! So comfortable and stylish, and they give this masculine-vibe which I adore! Colors are the beauty of life and the seasons and we always want to have the best and most attractive colors in the summer and spring season that will help us to have a great trendy and stylish look that we love and use in our dressing. Your designs and the color combination are so great and attractive.